Belcat's The Eyes Overdrive Distortion Pedal is a Re-Routable Dual Distortion Pedal allowing switching of overdrive and distortion effects back and forth. A nice sounding heavy fuzz is produced with both pedals on simultaneously, and true bypass functionality ensures that you have a monopoly on sound options and quality with this pedal. 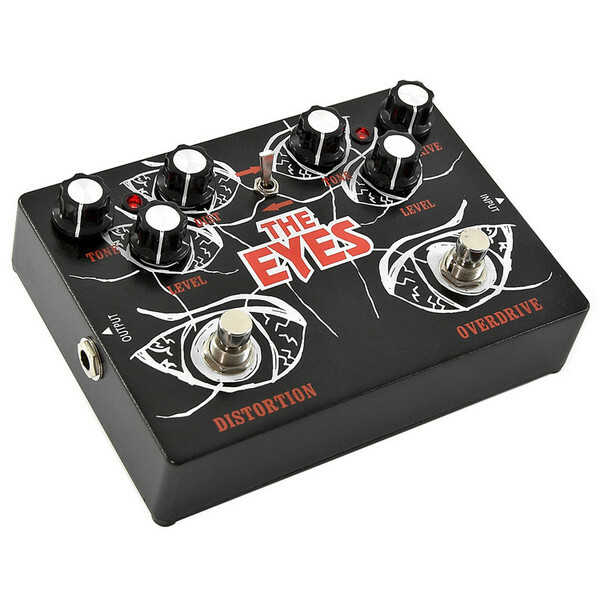 'The Eyes' is a dual overdrive and distortion pedal, which means you can distort your overdrive, or overdrive your distortion. When both pedals are on together, a nice sounding heavy fuzz is produced; the overdrive solo produces cleaner sounds, and the distortion is very full sounding and fat. With a switch to change which comes first, and a full set of tone, level and distortion/drive controls on each channel, The Eyes is one of the most versatile pedals on the market. A solid footswitch can be operated with either a 9v Battery or an Adapter, all of which is housed in a solid steel casing. Better still, it operates with True Bypass Functionality. True Bypass sends input signal to output directly when the effector is off. The signal will flow well when the effector is off even in the absence of a power supply. These features together ensure this pedal an authenticity and enduring value for money.